Imagine a world free from war, terror and violence, where drones are stripped of their aggressive associations. What will become of these war machines once there's nothing left to fight for? 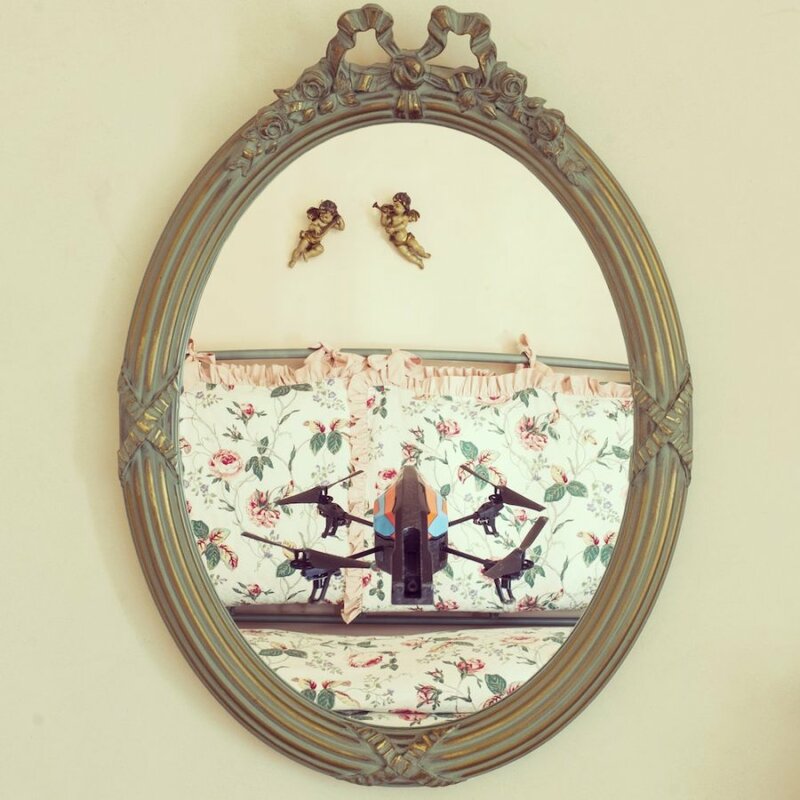 Italian artist collective IOCOSE poses one possibility with "Drone Selfies," a snarky photo series that proves drones are just like us -- i.e., can't resist snapping their best angle in the bathroom mirror. While we can't quite discern whether or not said drones are making duck face for the camera, we can confirm the aerial weapons look damn good. The "Drone Selfies" are part of a series titled "In Times of Peace," which imagines potential activities for drones post-war. In an earlier edition, for example, they ran 100 meter races and logged their progress in a Nike app. "This series displays the daily activities of drones," Paolo Ruffino, one of IOCOSE's four members explained in an email to the Huffington Post. "What would they do if they were not involved in war scenarios, or used by human beings to deliver parcels, take photos of unreachable areas and so on? We think drones would probably keep themselves busy with very banal activities, repetitive tasks that do not need much imagination." Despite the glorious silliness of the project, there's a tragedy to the underlying idea that drones, and perhaps humans as well, feel useless without war. In Ruffino's words: "The merging of war and peace is at the centre of our project, but even more than that there is the difficulty of imagining 'peace' per se. The drones we have captured in our work cannot possibly imagine anything that is not boring and useless, as much as we are probably similarly unable to imagine how to live in 'times of peace'. The banality of the selfies is a way of communicating an uncomfortable feeling." 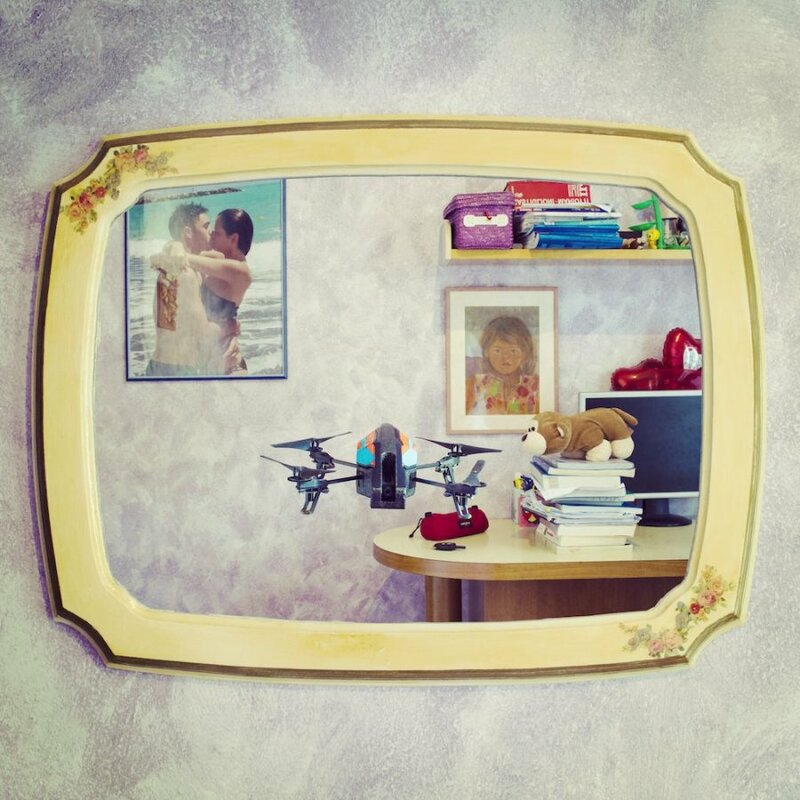 The drones are captured in the comforts of a domestic setting, surrounded by the trinkets, photos and commercial goods that often help orient a human selfie. One difference, however, between human selfies and their drone counterpart, is the dreaded "selfie arm" -- the appendage that always gives your selfie away as such. Turns out drones are relieved of this burden. "Most drones in commerce come with a built-in camera, so if they were to take selfies of themselves, their easiest option would be to use those," Filippo Cuttica explained to Creator's Project. "The fact that the outcome looks kind of awkward adds an interesting layer to the images, as it captures the (failed) attempt of technology to mimic human behavior. We imagined drones using their skills and potentialities in different and unusual ways, flying just for the sake of jogging and using their built-in camera for trivial purposes." As for the endless barrage of think pieces that come along with #selfielife, it remains to be seen whether drones too will self-photograph with such existential angst. "Our drones are definitely presenting their own images, taking photos to create and promote their public image," said Cuttica. "We cannot really say whether they like themselves. They are not humans, after all." See the drones do their thing below and let us know your thoughts in the comments.